San Diego native Devra Gregory has been dancing professionally for most of her life, but for the last 15 years, she’s taken on the persona of Michael Jackson, completely morphing her looks, moves and style into his unique stage presence. For a short run in December, local audiences will get the chance to travel through time with Gregory and learn how this classically-trained dancer transformed into a skilled performing artist, impersonating one of the most iconic male superstars of our generation. “The Woman in the Mirror, A Dancer’s Journey,” set for Dec. 1 – 9 at the Lyceum Theatre Downtown, is a one-woman show that takes the audience on Gregory’s very personal and inspirational life journey. As a child growing up in Chula Vista, Calif., Gregory (then Yufe) says she studied classical ballet from a very early age with the full support of her mother, although her father never took an interest in her dancing skills. After graduating from Hilltop High School in 1976, her career of dance took her many places, but that path took its biggest turn when she was hired as a back-up dancer for a Vegas-style celebrity impersonator show in Aruba in the late 1990s. That three-year gig would prove to be a major catalyst in the trajectory of her life. Soon after her arrival in Aruba, her prior choreography experience expanded her role to “dance captain” but she said she still wanted more. After noticing a drag queen performer in her group had a Jackson character, she saw an opportunity to create the King of Pop on stage herself, as an authentic woman in drag, although she’d never heard of the term “drag king” before. “I started to look at my face and at Michael’s face and decided I could pull it off,” she said. Initially, her wishes were met with a great deal of resistance among her troupe, but encouragement and an audition from the producer eventually led to a stand-in gig as Jackson, and then it was back to the dance-line, but not before she was hooked. When the Aruba contract ended, Gregory returned to San Diego and was immediately hired by Lips Restaurant, where she worked for several years perfecting her tribute and learning new songs. While the Lips gig was steady and supportive, Gregory said she soon began accepting other independent gigs in Los Angeles and elsewhere around San Diego, even performing at one point with the San Diego Kings Club at a Christine Kehoe fundraiser. Once she finally left Lips in 2007, she forged ahead on her own. Despite Jackson’s vast repertoire of available music, over time Gregory decided to stick to perfecting the more popular ones, with Smooth Criminal as her favorite. When Jackson’s sudden death shocked the world in 2009, Gregory was devastated. “Within an hour an agent called me and booked me on a gig, and then that night Channel 8 news came and interviewed me. It was overwhelming and ironically the same day I was moving … I didn’t even have time for it to register … I remember just throwing myself on the floor [of my new place] and crying hysterically. 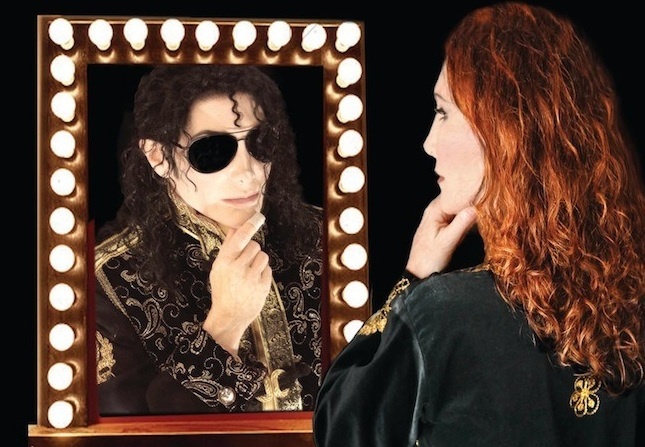 Two years ago Gregory self-produced her first Michael Jackson Tribute Show, and this past May, she produced the debut of Woman in the Mirror for a short run at the 10th Avenue Theatre. The director was Jessica Bird, now acting director at Mo’le’lo Theatre. Although the premiere show was financed in part by the Kickstarter fundraising website, this time around, Gregory is doing it all on her own, hoping to make it back in ticket sales. However, those wishing to donate tax-deductable funds may do so by contacting her through her website. Acting as producer, choreographer and star of the show is no easy task and Gregory identifies it as “overwhelming.” Her days are spent in interviews and promoting the show, while her nights are spent in three-hour rehearsals. She also attends ballet classes at City Ballet in Pacific Beach a few times per week, keeps up with her Modern and Jazz dance at the Academy of Performing Arts in La Mesa, and makes weekly trips to Culture Shock in Old Town to stay current on contemporary moves and hip hop. She is one busy woman. Gregory says her one-woman show has a universal theme: getting past your fears and empowering yourself, but mostly, it is about personal transformation. From here, Gregory hopes to focus less on Jackson tributes and take her one-woman show on the road around the country, find a producer who’d like to take her “under their wing,” or maybe even land a stint on a cable network. One thing is for certain, there is no end in sight for this 54-year-old dance phenom. “I’ll do this as long as my body holds up … I never thought I’d be doing this now, at this stage in my life. Many years ago I made a promise to myself to keep dancing but I thought that would be to take classes and stay in shape – I didn’t realize it would be to produce my own show,” she said. “A Woman in the Mirror: A Dancer’s Journey” runs Dec. 1-9 at the Lyceum Theatre, Downtown, located at 79 Horton Plaza. Specific shows are Dec 1 at 8 p.m.; Dec. 2 at 2 p.m.; Dec. 5 and 6 at 7 p.m.; Dec. 7 and 8 at 8 p.m.; and Dec. 9 at 2 p.m.
For tickets, visit lyceumevents.org or call 619-544-1000. To learn morea bout Gregory or the production, visit her Facebook page “Dev as Michael Jackson” or visit DEVasMJ.com.